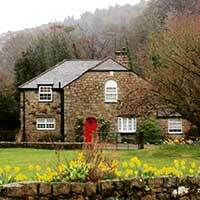 There are a number of luxury abersoch cottages and abersoch self catering cottages and abersoch holiday cottages and luxury llanbedrog cottages and llanbderog self catering cottages and llanbedrog holiday cottages in Llanbedrog, which are ideal for all Llanbedrog and Abersoch have to offer. There are a number of abersoch caravan parks and abersoch caravan sites and abersoch camping sites and llanbedrog caravan parks and llanbedrog caravan sites and llanbedrog camping sites in Llanbedrog, which are ideal for all Llanbedrog and Abersoch have to offer. There are a number of abersoch Pubs and public houses and abersoch eating places and abersoch restaurants and llanbedrog Pubs and public houses and llanbedrog eating places and llanbedrog restaurants in Llanbedrog, which are ideal for all Llanbedrog and Abersoch have to offer. There are a number of abersoch businesses and abersoch local businesses and llanbedrog businesses and llanbedrog local businesses in Llanbedrog, which are ideal for all your needs in Llanbedrog and Abersoch. There are a number of abersoch beaches and abersoch walks and llanbedrog beaches and llanbedrog walks in Llanbedrog, which are ideal for all your needs in Llanbedrog and Abersoch. Mae pentref Llanbedrog yn eich croesawu i dreulio gwyliau hapus yn ein plith. Gobeithiwn y mwynhewch yr ardal, ei harddwch a'i distawrwydd ac y bydd gennych gofion cynnes i'r dyfodol. We now have a www.llanbedrog.info car or window sticker available to advertise our village and its businesses. If you would like a free sticker please contact us or sending us a stamped self addressed envelope and we will send you one or two. Llanbedrog Information web site has been set up to show you what we have to offer in our wonderful friendly village, it has lists and links for all the local providers to Llanbedrog, Abersoch and Pwllheli of accommodation providers (Bed and Breakfasts, Self-catering holiday cottages, Caravan and Camping sites), Pubs and Restaurants around us and Abersoch, Information on the Beaches, Activities to plan your holiday, Walks and Coastal Path walk information, Village history, Transport, Taxis, Estate Agents, local Councilor, in fact a wealth of useful information in fact we like to call it "all you need to know about Llanbedrog"!. We have spent a decade complying this so hope you find it as useful as we do! Enjoy all Llanbedrog, Abersoch and Pwllheli have to offer. The village gets its name because of the establishment of the Church, which is attributed to St Pedrog who lived in the 6th century. Llanbedrog is one of the key centres of the unique Lleyn Peninsula, a semi paradise tucked away beyond the mighty mountains of Snowdonia. It is especially renowned for its sheltered sandy beach (the most sheltered in North Wales) nestling under a steep rocky headland covered with picturesque heather and fringed by pine trees. The breathtaking beauty of the approach road has probably been painted and photographed more often than any area in this peninsula of unforgettable scenery. Whilst the beach is a mecca to thousands of holidaymakers annually, the parish itself has many other facilities to offer. These include sea and river fishing, sailing and boating and pony trekking. Oriel Plas Glyn-y-Weddw Arts Centre in Llanbedrog, is Wales' oldest gallery, is a magnificent Grade II* Listed Victorian Gothic Mansion, overlooking Cardigan Bay and the mountains of Snowdonia. The Gallery has full access for the disabled and is a non-smoking establishment. It also offers information on types of crafts and goods FOR SALE, stocks art materials in the shop, provides information on the Art Collector Plan - interest free finance, the Gallery can also be used as a wedding venue, it hires rooms for business meetings or family functions and a Coffee bar well worth a visit and one of the crown jewels of our village. It also has a Self Catering Holiday Apartment (see our Self Catering Holiday Cottages page). For those who enjoy walking there is an abundant choice but unquestionably the most stunning spectacle of all is the panoramic view from the top of the local mountain, Mynydd Tir y Cwmwd, Llanbedrog Headland, where you can see the new "Iron Man" placed in position in 2003. It is also noteworthy that Llanbedrog used to be the only village in Lleyn which could boast of so many modern facilities · these included a doctor, chemist, district nurse, police station, sauna baths, hotels, garages, shops, post office, 'Old Tyme' dances, church, chapels, school and even a cemetery. The old church cemetery goes back 300 years and is well worth a visit. Sadly many of these facilities (such as the police station, sauna baths, hotels, shops, old tyme dances) have vanished but the history lives on. The climate is also worthy of special mention. This is mainly because the peninsula resembles an island, being engulfed on three sides by the sea, and it is also situated on the edge of the Gulf Stream. 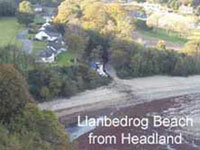 The exceptionally sheltered position of Llanbedrog gives it the best of both worlds. 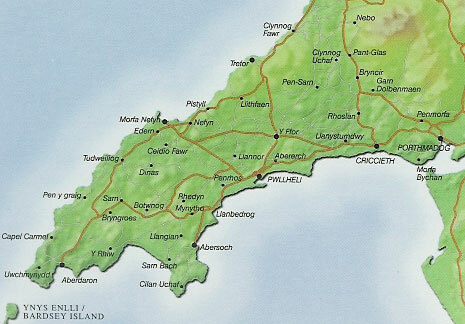 The hinterland of Lleyn is a district rich in historical associations and legends, with scenery that is unparalleled in the whole of the British Isles, scenery that will live vividly in the memory of the thousands that visit it annually. Indeed Lleyn, where the Welsh language is predominant, has a "foreign" atmosphere, which may be enjoyed without the expense and inconvenience of going abroad. Pwllheli is recognized as the capital of Lleyn, and the town centre becomes the area's focal point with its bustling open air market held on "Y Maes" with its numerous stalls, every Wednesday. The crest of Pwllheli, an elephant and castle, has close links with the Black Prince and a Spanish Princess, the Infanta of Castille. It also boasts a new Marina the largest in North Wales and home to the Pwllheli Power Boat Club and The Pwllheli Yacht Club to name but two. Nearby Abersoch is the largest yachting centre in Wales and the South Caernarfonshire Yachting Club based there, is one of the leading clubs in the country. The feats of its racing yachts are renowned country wide today and in the past. At Llanengan Church the rich covered oak screen is considered to be one of the oldest in Wales. The church was founded by Einon, King of Lleyn, in the sixth century. Aberdaron, the land's end of the Peninsula, is further from a railway station than anywhere in England and Wales and is the jumping off stage for Bardsey Island where 20,000 saints are reputed to be buried. The last "King" died in 1926 and in olden times one pilgrimage to Bardsey was considered equal to three pilgrimages to Rome. Nearby is the Whistling Sands Beach which whistles when walked upon when there is bright sunshine. The whistling is due to small particles of sand of peculiar shape and there is only one other beach like it in Europe. On the other coastline is Nefyn, made one of the Royal Boroughs of Wales by the Black Prince in 1355, and it is historically interesting as the spot on which in 1284 Edward I held a grand triumphal procession in which tournaments played a leading part. The Porthdinllaen lifeboat is one of the most modern in the British Isles. 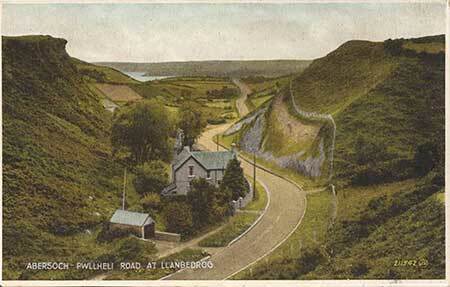 Chapters of history have been written about Nant Gwrtheyrn, or Vortigern's Valley, situated on the Northern Coastline. The famous "cork screw" road leading to it has been the testing ground for internationally famous motor firms. The fabulous Castle Gwrtheyrn was destroyed by a fire from heaven, according to legend. This former quarrying village and home of Canolfan Iaith Genedlaethol Nant Gwrtheyrn - is now the National Language Centre for Wales. The centre is the only full-time residential Welsh language teaching centre open in Wales and is open all year. Hundreds of visitors visit the centre to enjoy its unique atmosphere. 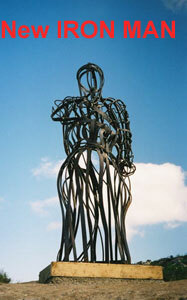 Click for the Nant Gwrtheyrn Web site or Learn Welsh on the left. Llanbedrog and its hinterland may not be a fantastic world of garish colours and bright lights, but it is for the holidaymaker a haven of peacefulness and a retreat from the hurly burly of modern existence. The village has twice won the Best Kept Village competition, as far back as 1961 and again in 1977. Here, in this jewel on the coast of Cardigan Bay, the tourist will find a very warm and very sincere welcome. It is a tradition of which the inhabitants are proud and has been maintained throughout the years.